The 5th and 6th May had been occupied on my calendar for months and the excitement and anticipation in the advent of this weekend had become all consuming. 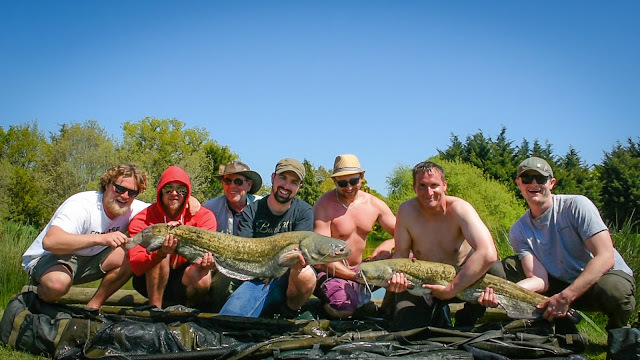 My good friend Shaun, whom I met whilst pike fishing on Fordwich 7 years ago, is getting married this summer and decided to spend his stag-do indulging in his favourite past-time with a group of likeminded companions. 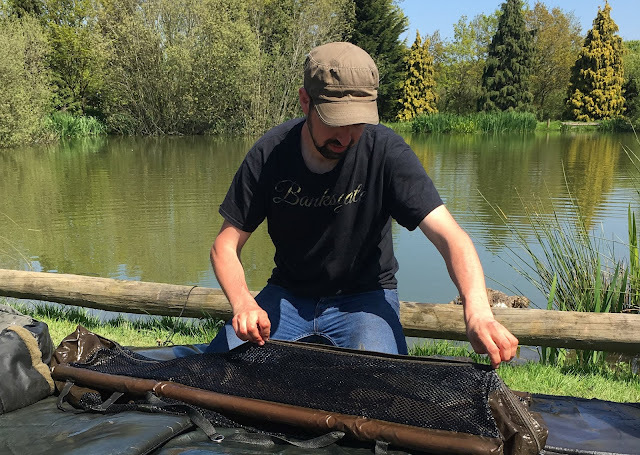 The chosen venue was 'Charlie's Lake' - a small water in the garden of England, predominately home to catfish but also containing a good head of carp and silvers. We had fished here together before, firstly under the previous management then again with the now not-so-new owners, Steve and Karen, and the transformation was unrecognisable. 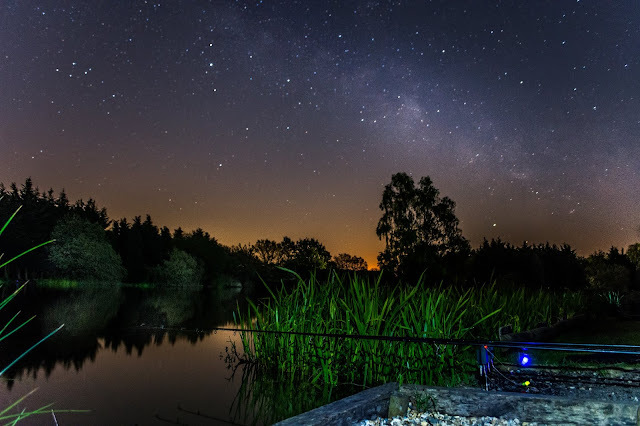 The banks and swims are well maintained, reasonable fish-centred rules are enforced and facilities such as specialist catfish tackle hire (slings, mats and nets) and toilets and showers are available. Now, wild fishing in an untamed nowhere-land this is not but it was a comfortable venue for such an event and whilst some watercraft is still required, at this time of year regular runs are not uncommon. And so seven of us convened at the gates to the fishery early on the Saturday morning. For me this marked the halfway point on a 424 mile round trip! 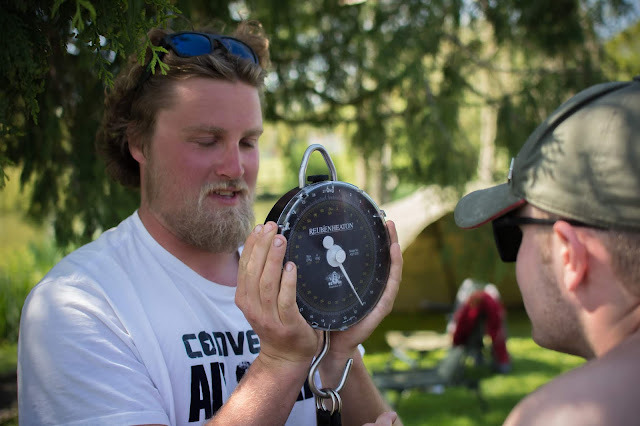 Tickets were purchased, pitches were chosen, rods assembled, rigs checked and away we went. Owner, Steve, gave some good advice regarding rigs, spots and bait. Without wanting to seem arrogant I had my own ideas about how I wanted to fish on this occasion but decided to take heed to his suggestions on one rod and fish the other two my way and see what worked. Steve was suggesting relatively small baits on a shortish hair however, I had caught well there before on double 20mm halibut pellets and had had my PB on a 30mm bloodied eel pellet. Steve didn't object to me using these baits but seemed very doubtful that they would catch me any fish. So I tried all three and the double halibut pellets were the first to send the reels screaming. First blood was a tiny kitten but then a brace of low doubles followed in close succession and so I changed all three rods over to this approach and gave up on the small baits. The key to this success in my opinion, is that I drenched everything - loose feed and hook baits in glug. Catfish have tiny eyes which are not much use in the dark depths in which they feed. Instead, they detect their meals with their barbels which sense taste and smell from great distances. For this reason I ensure my baits leak as much attraction as possible so they are drawn to them easily. Shaun with a 24lb wels cat. Thankfully, as the day progressed most of us had caught at least one. The biggest of the first day went to Shaun at 24lb. Banter was ripe but all good fun. Most conversation was centred around the usual issue of 'carpiness' and taunts regarding the symmetry of our setups, or lack thereof. As the sun started to set a take-away materialised and we all sat together indulging in a veritable feast beneath the stars, affirming how good life can be and drinking to the happy couple. Everyone promised to jump out of bed if anyone caught a fish but as my delkim started to sing at half past midnight, the antiphonal sound of snoring continued, undisturbed! I landed the fish alone without too much trouble and was joined as I came to take photos by a few of the others who witnessed the scales turn just past twenty pounds. I had trouble sleeping after this and so, as the sky was clear and the stars were shining bright, I took a moment to take a few long exposures and picked up a bit of Milky Way. The orange glow coming up on the horizon is in fact the moon in its waning gibbous phase rendered a deep red becoming progressively paler as it rose. The next day brought everybody success. Shortly after the breakfast ritual was complete I lost a good fish. I had never felt anything like it attached to my line. It had ploughed straight for bank-side cover and could not be turned. On the spur or the moment I decided that I could not give any line and that it would be better for it to be left with a short hooklink sporting a barbless hook which hopefully could be expelled eventually, than to allow it to reach cover and potentially become tethered. The line broke at the knot leaving me in a sulk. It did not feel good at all. Jon weighing in a 23lb catfish under the watchful eye of Shaun. My swim went quiet for a while and eventually I reeled in for a while. I distracted myself taking photos for the others, some of whom had not fished for cats before and could not stop marvelling at their incredible strength. I recast and before long I was into another good fish. This fish was hooked by an overhanging tree but I muscled it out into open water early on in the fight by kiting it round in the direction it was swimming - I think I confused it! Nonetheless, this fish tore up the swim and took a lot of line. Shaun, who was fishing in the swim to my right, kindly reeled in to give me more space. There was no way I was going to loose another in the same way so a slightly softer approach was employed. The fish held deep, kicking up clouds of silt from the lake bed as large ripples emanated from each unseen epicentre. By now I was surrounded by friends all sharing their support and delighting in the moment together. An overwhelming sense of relief was felt and joyful cheers were released as a large-headed cat begrudgingly slipped into the net. 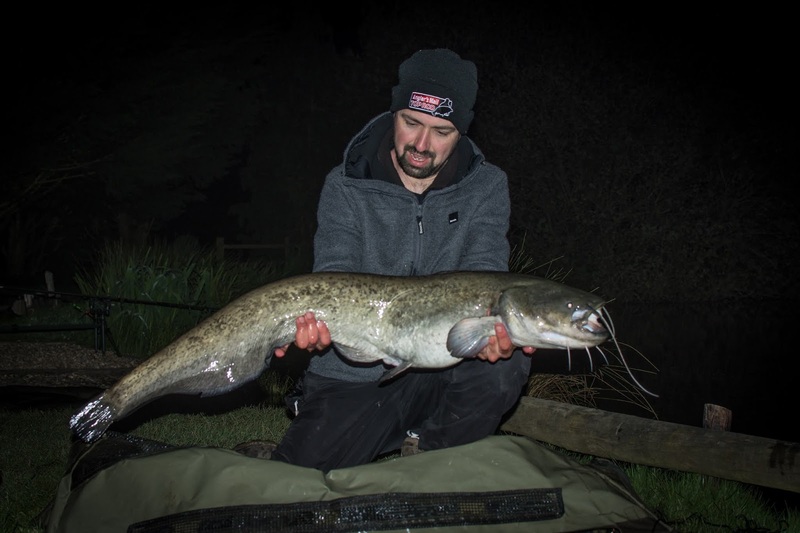 As I lifted the scales aloft I realised the sling contained a new personal best catfish of 30lbs 1oz! It is not one of the biggest in the lake and pales into insignificance when compared to captures from the Ebro or the Po but to me it is a spectacular specimen and I am completely made up about it. 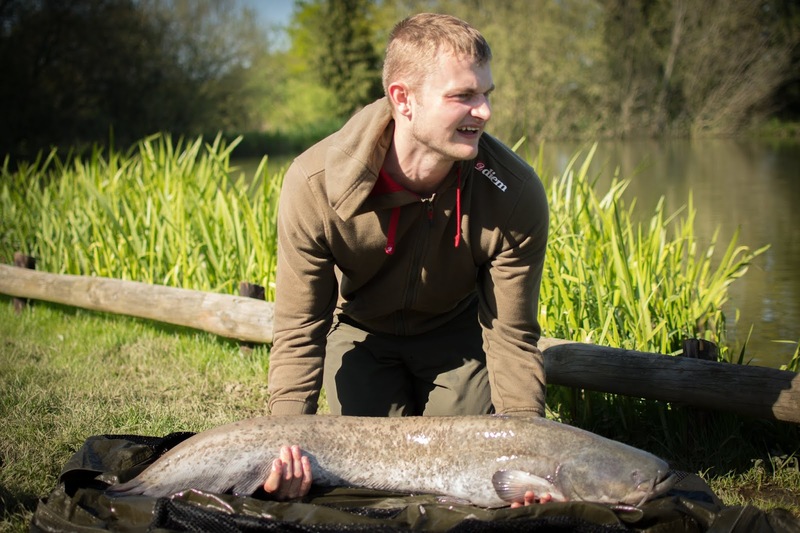 My new PB wels catfish at 30lb 1oz. What I have omitted to mention is that whilst I was battling my fish, Tom in the swim to my left also hooked into a good fish and so we took the opportunity to set the camera running and get everyone into frame for a quick group shot for posterity. Taking a still frame from the video resulted in a slightly lower picture quality but facilitated the shot with minimum fuss, allowing the fish to be returned quickly. After this I was on a total high. The vibe amongst all the guys had been so positive throughout the weekend and between us, due to some not having caught cats before, there had been 5 new PBs! Aside from a little sunburn the weather had been kind to us and we said our goodbyes with sore necks and aching arms. So all that remains is to thank Shaun for bringing us all together for a cracking social and to congratulate him and his future wife, Katy, and to wish them every happiness. A couple of trips to the River Tees, including a pb!